Want to buy it? Here you go. It's in paperback, too! And here's the audiobook version, narrated by the brilliant Sunil Malhotra! 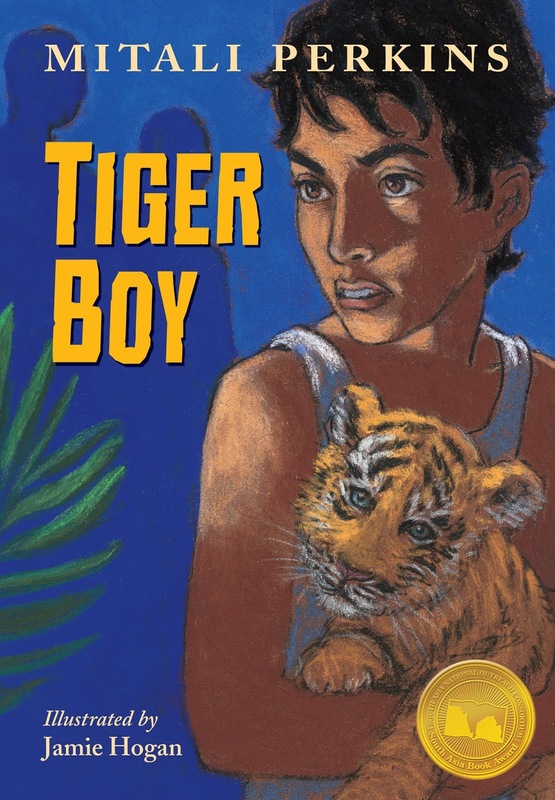 From the writer (Mitali Perkins), illustrator (Jamie Hogan), and publisher (Charlesbridge) who brought you Rickshaw Girl, chosen as one of New York Public Library's best 100 books over the past 100 years, comes an exciting adventure about a boy who loves tigers. When a tiger cub goes missing from the reserve, Neel is determined to find her before the greedy Gupta gets his hands on her to kill her and sell her body parts on the black market. Neel's parents, however, are counting on him to study hard and win a prestigious scholarship to study in Kolkata. Neel doesn't want to leave his family or his island home and he struggles with his familial duty and his desire to maintain the beauty and wildness of his island home in West Bengal's Sunderbans. (Khabar Magazine) Perkins’ prose is exquisite. 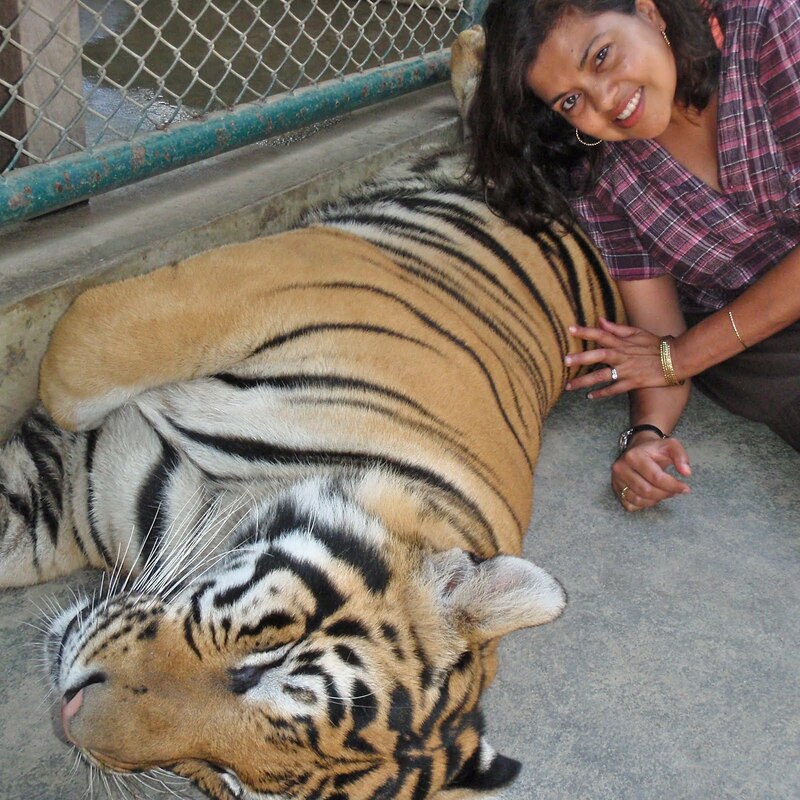 She paints a vivid picture of the landscape of life in the Sundarbans—the cool water of the freshwater pond that doubles as a swimming pool, the swaying golpata branches in the monsoon rains, the evening aroma of jasmine flowers and the wild guavas in the mangrove forest. The theme of environmental sustainability binds this riveting plot. 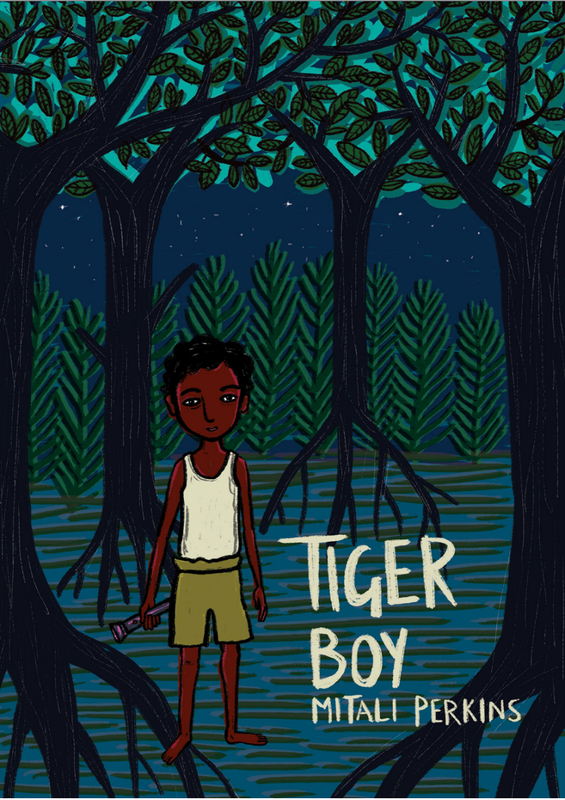 (Kirkus) The Kolkata-born author ... lovingly depicts this beautiful tropical forest in the context of Neel’s efforts to find the cub and his reluctance to leave his familiar world ... the sense of place is strong and the tiger cub’s rescue very satisfying. Pastel illustrations will help readers envision the story. A multicultural title with obvious appeal for animal-loving middle graders. Book of the Week (CCBC) — ... Just the right amount of information about the complexities of economic and environmental issues is seamlessly incorporated into this warm, lively chapter book featuring occasional illustrations and a satisfying and believable ending. (Publishers Weekly) ...Perkins’s (Bamboo People) evocative descriptions, boosted by Hogan’s dramatic pastel drawings, convey an intense love and respect for the region’s culture and environment. Readers should find it easy to become invested in the cub’s return to the reserve and in Neel’s fight to help create the best future for himself, his family, and his home. (The Horn Book) ... Fast-paced action, lots of references to the local flora and fauna, and clearly laid-out moral dilemmas come together in a satisfying way. The glossary and end notes add much to the story and answer any questions that a reader unfamiliar with the archipelago might have. (Great Kid Books) ... A fantastic read-aloud! ★ (Redeemed Reader) ... The author packs a lot into a simple story: adventure, danger, suspense, humor, and heart. And who could resist a baby tiger? Ultimately the story is about that classic teacher’s adage, living up to one’s potential. Even reluctant readers should be engaged from the first page, and the charcoal-on-canvas illustrations add appeal. Buy the book now, and check out our discussion/activity guide.